We can not celebrate the holidays without eating a little dessert. Right? I love finding some chocolate in my stocking…or a box wrapped with a great big bow on top! Today I am sharing some unique ideas that you need to try out this season. A store found only in New Orleans, but lucky us gets the privilege to order online. If you are looking for a truly unique sweets gifts that will no doubt utterly delight, then you have found your source. Can chocolate be beautiful? Because these definitely are. They are like artwork! Not only will you find signature chocolates, but also the prettiest Macarons you’ve even seen. It doesn’t stop there though. During Mardi Gras season you’ll find the best King Cakes around! The holiday boxes are very festive with their chocolate and pink (peppermint!) candies. Did I tell you that they just melt in your mouth? I’m sure you can just imagine! Today we’re talking chocolate, but this fabulous company also does a lot with tea, coffee, nuts, gifts and crafts. All Fair Trade and most is organic. 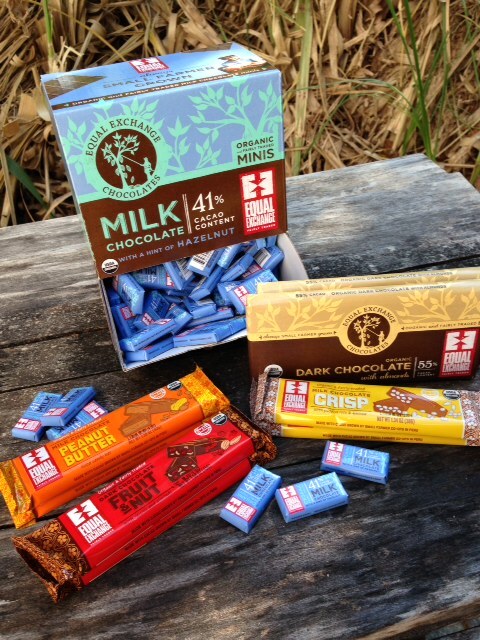 I can’t stop grabbing the Organic Milk Chocolate with Hint of Hazelnut Minis. They are just the perfect size for an after dinner bite. They come in a handy dandy pull out box so you can set them on the counter – at a business! The Organic Dark Chocolate Almond Bar is a yummy gift for any chocolate lover. It’s nice and big in size and would work wonderfully in a holiday basket. And the candy bars? Which one would you want to try first? Organic Dark Chocolate Fruit and Nut with Raisins & Almonds or maybe the Organic Milk Chocolate Peanut Butter. Or my favorite? The Organic Milk Chocolate Crisp with Puffed Rice & Quinoa. Wouldn’t you love to find these in your stocking?? Another good one for stockings for the kids is YumEarth! The boys and I have been quite addicted to these lollipops since my review of YumEarth in September. The gummies and sour beans are fun to throw in their lunches too because they are the hit of the lunch table as they share their goodies. 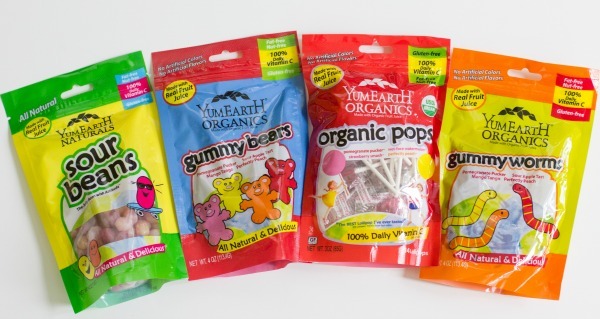 I don’t even feel guilty with these organic candies free of high fructose corn syrup and artificial dyes. Find YumEarth in stores locally including Walgreens! Click on this store locator link right now to find one near you then ruuuun to buy! Don’t forget this $1 off coupon on their home page! Seriously you need some in your freezer at all times. Having company stay this season? You want to impress! Could not eat those Belgian Chocolate S’mores fast enough! 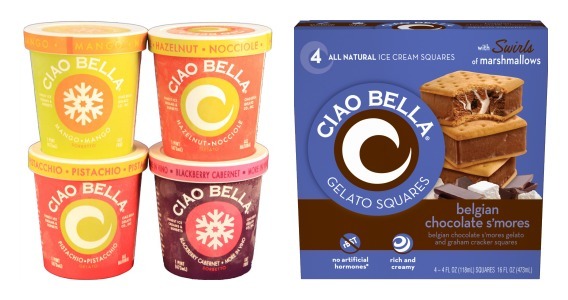 We also tested out the Roasted Hazelnut and Sea Salt Caramel Gelatos and the Blood Orange and Coconut Sorbets. My only complaint is the containers are not big enough for this house. ha! I received these items for free for review and all opinions are my own. This giveaway will end on November 19, 2013 at midnight EST. Winners will be drawn via rafflecopter. Once a winner is drawn I will contact them and they will have 48 hours to reply before I draw a new winner. Giveaway is open to anyone in US and you must be 18 years of age or older. Giveaway not affiliated with Facebook & I release them of liability. Winner will be posted in the rafflecopter widget. Papa Murphy Taco Pizza is Here! I love sweets - I always buy them for me!! I always have sweets on hand. My grandchildren LOVE coming to visit because they know they will get sweets here. My son and grandson are always looking for treats. I buy sweets for my husband. I buy sweets for me! 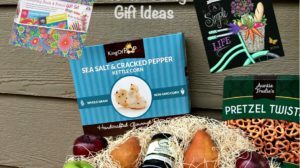 I would love this yummy prize! Aside from myself, I do buy sweets for my kids on a few special occasions throughout the year. I like to buy sweets, especially dark chocolate to share with my office mates at work! Hate to say it but ME! I would buy sweets for my Dad! yes, my mother and mother in law; they both love chocolates! i always buy sweets for myself!! i do buy treats for my daughter,too, because she loves them just as much! We buy sweets for ourselves and our kids. My husband was a sweet tooth! I always buy sweets for myself! I buy sweets for my husband all the time he is addicted to sweets. Yes I myself like sweets and so do 4 grandchildren who live with us..Sounds Yummy..
My hubby, who has an enormous sweet tooth. My Dad and my sister love eating sweets and of course, I love eating chocolates and any type of candy. Thanks for a really awesome giveaway! I always buy sweets for my sweetheart, and vice versa. I would use all the organic treats for my grandchildren who visit all the time! I'm the ding-a-ling with the sweet tooth. My elderly dad who lives with me also has one, so we're both afflicted. is there person you always buy sweets for? yeah,,,MEEEEEEEE! I frequently buy chocolate for my boyfriend. I love to buy treats or tidbits, as she calls them for my, Aunt Marie! I always buy sweets for my hubby and daughter!! I usually buy sweets for myself and occasionally chocolate for my husband. I would be excited to give him this chocolate. Truth be told, I buy chocolates for myself. What an AWESOME prize pack! I love sweets! The whole fam would love this! I would like to win this for my husband who has a sweet tooth. My whole family has a sweet tooth, but it's always around so everyone stays calm and happy. My secret to a successful home - LOL. I buy them for myself and my friends. I don't buy many sweets or treats but I could get behind some chocolate hazelnut minis in a hearbeat! I always buy them for myself and I hide them! I buy sweets for myself and my husband. I try not to eat much at a time! I buy them for myself and family on special occasions! I buy sweets for my husband, he has a sweet tooth. Me!! ;) I do buy my sweet hunny bunny treats too!! I always buy sweets for meeeeee!! Not one person, but who can resist sweets! Actually, I buy them for myself a lot! I typically buy way more sweet things for my hubby than I do for myself and the 3 kids combined! This would make a great gift for my husband. Thanks for the giveaway. Under various reasons, I buy sweets for myself. Yes - we should have something for Thanksgiving along the chocolate line. The sweets are for me!!! My whole family love sweets. My son eats gluten free he has celiac's disease so we buy him GF only. I always buy sweets for my sweetie and my mom..and of course, myself. I buy them for myself and for the son with whom I live. If I did not get some specially dedicated to his enjoyment he would partake of mine, sometimes to the point of "all gone." Though I agree that purloined sweets really do taste best, I am not happy to discover an empty package when my chcolate need must be fed. My mom has a serious sweet tooth!! I buy sweets for my chocoholic daughter, and my husband who bring them to work. My husband! He LOVES chocolate! My husband and I always buy sweets for my Grand daughters. They just say Papaw and there we go to the candy store. I like to buy sweets for my husband. I buy sweets for myself. Yes I am always buying sweets for my mom mom because she is a diabetic! I used to buy sweets for my husband. The person I always buy sweets for is me. I buy sweets for myself and my son. 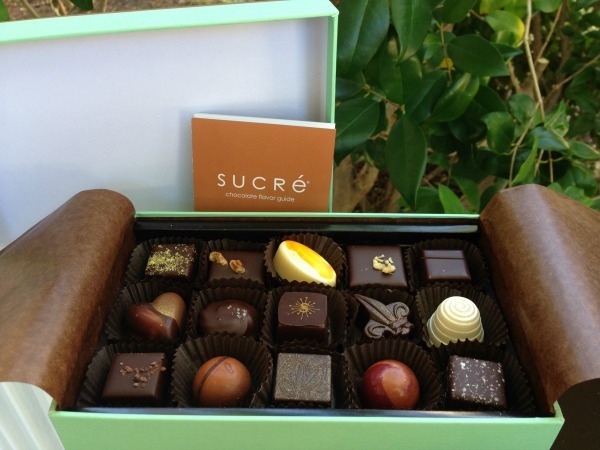 Those Sucre chocolates look amazing! I am the BIGGEST sweet tooth I know! LOL Thanks for the chance to win some great goodies! Yeah....myself...lol. but my nephew loves them too. I buy sweets for me and my daughters. Yes I do!ME!lol~thanks for the chance! I buy sweets for myself. All my family lives 13+ hrs away. My guy has to have his sweets. I buy sweets for my husband,and sometimes myself. It is pretty safe to say myself. While I do not eat alot of sugar - a little is nice every now and then. My whole family would love them! i try to give my mom something sweet at Christmas time. I like to buy sweets for friends and family for special occasions. I tend to buy sweets for my family. I like to buy sweets for my Mom around the holidays. I am not a great sweet eater myself. I tend to prefer salty and sour things to sweet. My mum, however, has a huge sweet tooth so I am always buying her candy, especially chocolate. Thanks for the giveaway. My children are sensitive to food additives and have severe allergies. This brand is safe for them to enjoy. Thank you for making treats that are safe for my kids to eat. I buy sweets for my kids. I always buy sweets for myself, of course!! Yes I buy sweets for my grandsons! For my kids and my mom. I buy them for my husband. He loves his sweets! Yeah, me! ;) I'm a sweet-a-holic! My fiance isn't much of one, so I won't have to share - haha! I would share them with my family! We all love chocolate!